As winter draws near, so does the thrill and excitement of your first ski trip of the season. The best ski trips are always the ones when you not only spend the entire day out skiing, but you get to relax after the long day with your family and friends inside a cozy, luxurious ski house. Here you’ll find how the world’s finest ski lodges are examples of strategic interior design and decorating that draw in many visitors from around the world every year. 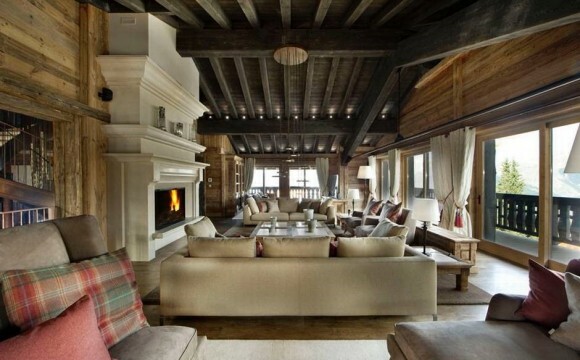 Use these tips to turn your cottage or other dwelling into the perfect ski house. 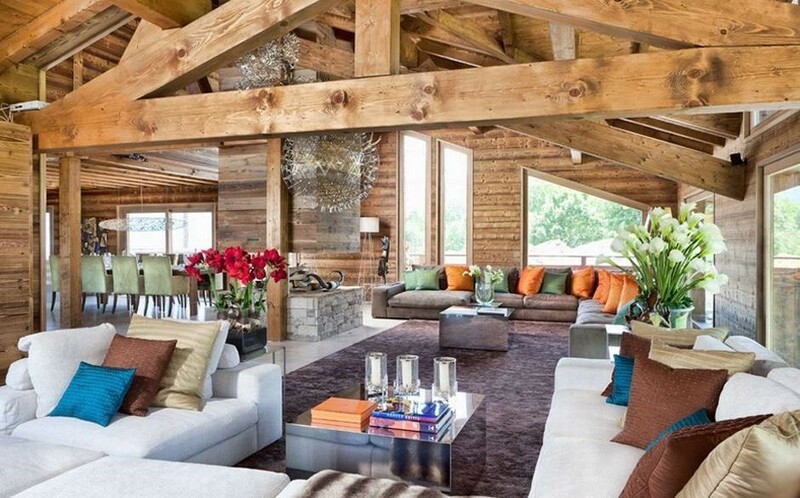 While there are exceptions, most ski houses consist of warm colours interspersed in the colour scheme. This may even include slightly warmer shades of white and grey. It is not hard to imagine that the warmer colours make us feel cosy. What can be better than stepping into a room where every detail is sending out warmth to defrost your body from a freezing snowy day? Let’s find out which colours will do the magic! RED: Red creates feelings of intensity and excitement, but is also associated with love, warmth, and comfort. Use less intense shades of red for a more relaxing look. Darker and less intense reds such as colours found in Fall foliage are pleasing to the eye. For even less intensity, add red to only accent items, such as pillows and small rugs. ORANGE: Orange can invoke feelings of fun and playfulness, while maintaining a warmth about it. Use natural tones of orange, such as the colours of leaves and flowers to create a pleasant natural look. Brighter oranges may be irritating. Dim orange lights, imitating light from a fire, can create a warming and intimate mood. Yellow is a cheery and warm colour. However, it is also a very reflective colour. You should try to limit the use of yellow in your ski house to more subtle and darker shades. BROWN: Most, if not all, shades of brown can work wonderfully in ski houses. This includes the different colours of different types of wood used for the walls, floors, and furniture. Brown is the colour most abundant in nature, therefore, creates a most natural look. BEIGE: Beige, off-white, or whatever you want to call it, is a group of colours that can add a warm tone without being too intense. Use it when you need a brighter room but would still like the feeling of warmth. Pure white is hardly found in nature (with the exception of snow) and can look too clinical. Wood: Wooden planks as walls will make the lodge look more like an old wood cabin. 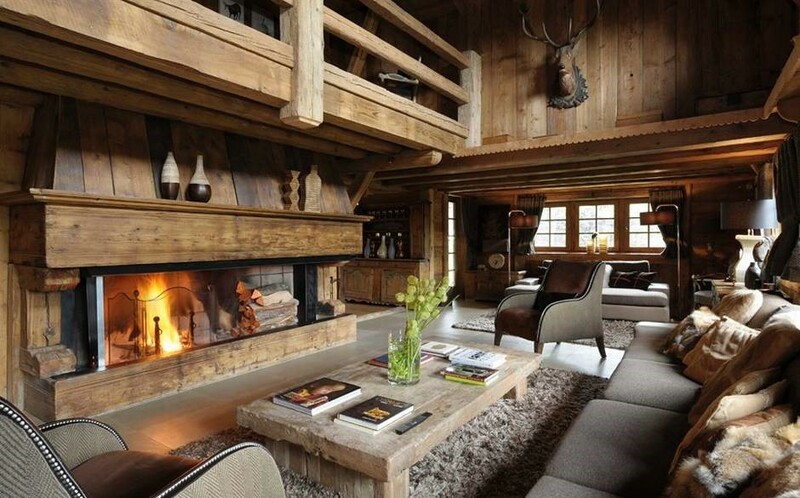 Wooden furnishings can also create a more natural atmosphere and can brings a sense of nostalgia and a feel for the great outdoors inside your ski home. It is durable and can be finished in many ways, according to your style and taste. Fur: The use of animal fur is dated back to a time when no part of an animal is wasted and humans depended on it for warmth. This look feels warm and cozy and will make the ski house more inviting. Use small fur-like materials for carpeting, small area rugs, and throws for this effect. Leather: Durable and waterproof, leather or faux-leather is a good choice for ski house couches and other furniture. Ski house furniture is usually on the larger side to accommodate larger gatherings of people, and heavily clothed people. As clothing will be wet at times, furniture should be waterproof and durable. Tables and chairs using large pieces of restored wood look beautiful. And large, wide couches are most welcoming to rest your tired legs on after a day out on the slopes. Window placement is important to maximize the amount of light coming in during the day. However, you may not be able to change the placement of your windows. Get the most light from your windows by not covering them with drapes. Drapery should hang to the side(s) of the windows to let the maximum amount of light in. To create a cozy atmosphere, dimmers are often used and lights are placed strategically to create the desired ambience. Windows and doors should be of the highest quality to prevent the leakage of heat. One of my favourite features in a house is the fireplace – no ski lodge is complete without one. When shopping for a fireplace, consider the size of the dwelling and how much heat is needed to heat up that amount of space, and the type of fireplace (gas, electric, wood. ), If you have the space, the grander the fireplace the better! Alpine: Create an Alpine theme with bare branches (optional: decorate the bare branches with Christmas lights or fake snow), rustic and natural-looking hardwood furniture, and a painted mountain backdrop. Decorate with wooden sleds on the walls. Wild Animal: Some people find being in the presence of animals peaceful. You don’t have to be a master taxidermist or spend money on a real mounted animal head. 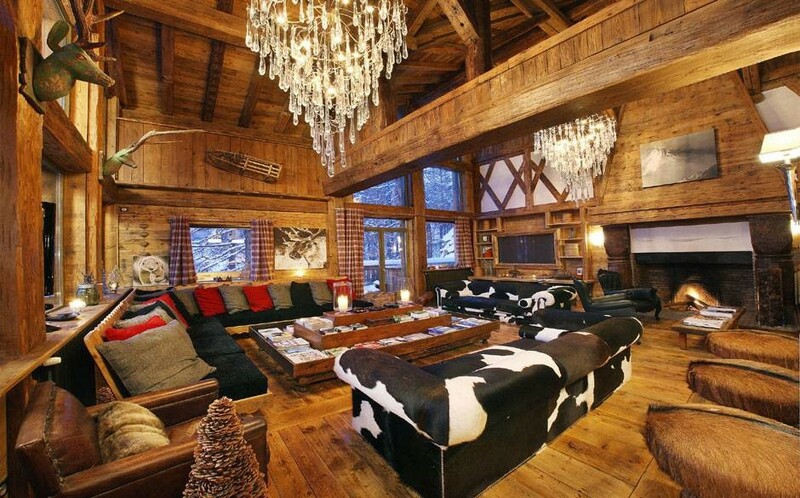 Create this look with wooden animals placed around the chalet. Small pieces of art can really liven up the room. Try pieces of aboriginal art or other wooden and natural-looking art. The important thing to remember is, whether you choose to decorate with Alpine theme or an animal theme, the decoration style should be unique and should reflect your personal tastes. I hope you use these tips to create your perfect ski house look because there is nothing better than having a sip of hot cocoa by the fire in your perfect, warm and cozy ski chalet after a long day out on the slopes. Trang Lam is a Canadian freelance writer and marketing specialist, she is passionate about interior design and home improvement. Trang wrote this article on behalf of the Ottawa General Contractors, a full service Ottawa-based home design/improvement company.